Page Street Publishing, 9781624144905, 240pp. July 16, 2019 will be the 50th anniversary of the Apollo 11 mission, celebrating an incredible decade in science history. In Eight Years to the Moon, unique personal stories of NASA engineers and MIT computer experts are interwoven with Nancy’s gripping style to tell the story of Apollo 11 in a fresh and riveting way. Despite incredible hurdles and catastrophes, Apollo 11 launched a successful mission within President Kennedy’s proposed timeline. The employees of NASA made the impossible possible—creating new technology and completely reimagining space travel. In Eight Years to the Moon, readers are transported into the space race of the 1960s. Nancy begins in 1962—when NASA had to build the Manned Spacecraft Center and space exploration first became a priority—and spans to the successful Apollo 11 mission. With firsthand accounts from Henry Pohl (director of engineering at Johnson Space Center), Glynn Lunney (Apollo flight director), and Frank Hughes (lead test engineer for the Apollo command and lunar module simulators), it’s easy to get wrapped up in the excitement of what it was like. In the words of Henry Pohl when he saw his first rocket test launch, “When that thing lit off I had never seen such power in my life…I decided right then and there that’s what I wanted to be part of…” And he was far from alone. 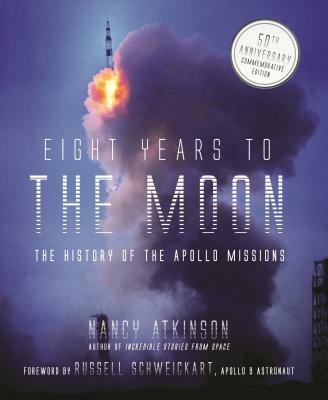 Filled with stories from those involved and interviews with other Apollo experts, Eight Years to the Moon is a book that will delight anyone who has ever looked up at the moon and wondered how we got there. NancyAtkinson is the editor and writer for Universe Today, a popular space andastronomy new site, and is a NASA/JPL Solar System Ambassador. She has writtenthousands of articles, writing daily since 2004 about the latest news aboutspace. She was the editor in chief for Space Lifestyle Magazine and also has had articles published onWired.com, Space.com, NASA’s Astrobiology Magazine, Space Times magazine and several newspapers in the Midwest.She has been involved with several space-related podcasts, including AstronomyCast, 365 Days of Astronomy and was the host of the NASA Lunar ScienceInstitute podcast. Nancy lives in Minnesota.